Oil Market at a Critical Point – What Next? The oil market entered a new era in November 2014 when Saudi Arabia persuaded fellow OPEC members not to support the oil price but to let it fall freely in pursuit of market share. The preceding years of oil prices above $100/b had driven the rapid expansion of high cost production, most notably US light tight oil (LTO or shale oil), and suppressed demand growth. The oil price fell rapidly from $80/b in November 2014 to $56/b in March 2015. At this point, Saudi Arabia added further downward impetus by raising production by 1 million b/d and a phase of stock build then ensued. By the end of 2015 OECD industry stocks had risen to a record high of more than 3 billion barrels. In January 2016, oil prices tested levels below $30/b. This process and the market and political ‘events’ that could impact it have been analysed using a scenario approach run through a proprietary suite of integrated demand-supply-price simulation models. 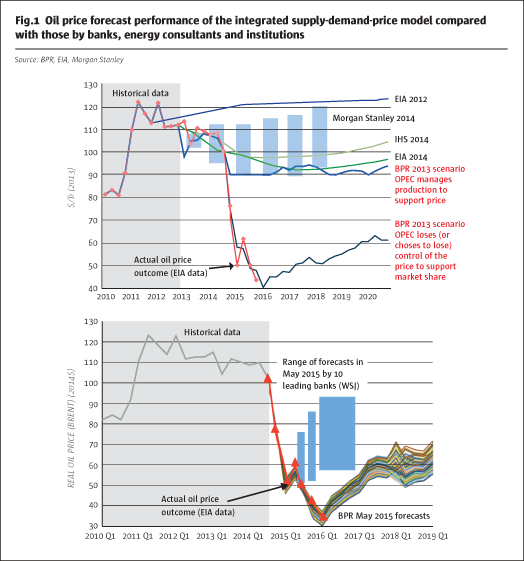 Over the last decade, this approach has consistently out performed forecasting by the leading investment banks, consulting groups and the EIA and IEA (Fig.1). The build up of excess stocks did not start immediately after the OPEC decision in November 2014. It began only after Saudi Arabia sharply increased production in March 2015, shortly after the accession of King Salman, and again in June 2015 (Fig.2). With Saudi Arabia producing more oil than the market needed, the first half of 2015 saw a significant stock build. 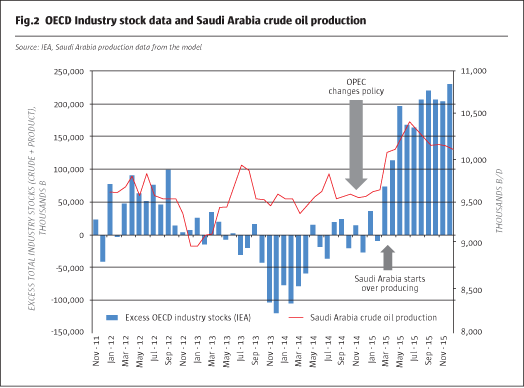 Saudi Arabia reined in production in the latter half of 2015 and the stock build phase came to an end. This left OECD industry stocks at record levels of over 3 billion barrels, with excess stock levels of some 200 million barrels (Fig.2). Since then, the oil market has been in supply-demand balance. However, excess oil stocks exert downward pressure on price. Oil prices tested levels below $30/b in January 2016. Recent pronouncements of a production freeze by Saudi Arabia and other producers provide only temporary fillips to the market unless followed through by real production cuts. Saudi Arabia’s condition that Iran freezes production at pre sanctions-lifting levels is clearly unrealistic, since Saudi Arabia absorbed Iran’s market share during the oil embargo between 2010 and 2016. However, these pronouncements do suggest that Saudi Arabia is becoming increasingly concerned about the state of its finances. Whilst a policy reversal is unlikely in the near term, a 'freeze' of production at early 2016 levels by Saudi Arabia and its fellow Arab OPEC producers seems likely. The immediate question is not if or when might Saudi Arabia rescue the oil market, but can the excess stocks be eliminated by 'normal' market processes. Saudi Arabia’s policy dilemmas and outcomes are discussed later in this article. The elimination of excess stocks can be achieved by a combination of growth in demand and decline in non-OPEC supply, both driven by the low oil price. We forecast a significant drop in non-OPEC production in the window 2016-2017. Much of this forecast drop in production is due to the long anticipated decline in USA LTO. The model outcome for the three most significant LTO areas in the USA forecasts a 0.8-1.0 million b/d decline in the period to late 2018 (Fig.3). The 'gravity-defying' resilience of USA LTO production to a collapse in drilling activity has surprised many commentators. However, LTO production is a treadmill and, ultimately, if no new wells are drilled, production must fall. Once the time lags in the process are properly accounted for, 'gravity', in the form of a 70% drop in drilling activity, must prevail and production decline. The most recent data show a significant decline in line with the model’s prediction. If we combine the decline in non-OPEC with the other factors influencing stock draw (demand) or build (Iran and Iraq increasing production), a window of opportunity exists in 2016 and 2017 to completely draw down the excess stocks. Given a likely range for non-OECD stocks, which are not reported, the modeled outcome for the key factors suggests the excess stock could be eliminated by mid 2017. Until the excess stocks are eliminated the oil price will continue to be vulnerable to the downside. This weakness will be ameliorated as stock data starts to indicate a significant stock draw is underway. With supply and demand in balance and the excess stocks eliminated, the oil price would become strongly influenced by spare production capacity. Due to deferred development projects in deep water and elsewhere, spare capacity is likely to be increasingly challenged during the next decade with upward pressure on the oil price. If the excess stock is not eliminated in this period, then an excess stock overhang will persist into the 2020s, weighing down on the oil price for a prolonged period. A mild recession in the period 2016-2017 would reduce demand by over a million b/d. It seems unlikely that Libya will return to full production capacity in 2016 or early 2017, but if it were to do so there would be an additional 1 million b/d of supply. Saudi Arabia increasing production again to more than 10.4 million b/d. Saudi Arabia has become a great deal more assertive in the Middle East and less predictable since King Salman took over from King Abdullah in January 2015. The intervention in the civil conflict in Yemen in March 2015 and the perhaps unnecessary expansion of oil production in the same month were significant departures from decades of well plotted, tried and tested policies. Given the unpredictability, it is possible that Saudi Arabia could respond to Iran’s production expansion by a production hike of its own. If any of these events transpire, the excess stocks are unlikely to be eliminated anytime soon by normal market processes and low prices would persist into the 2020s. This would leave a reversal of Saudi Arabia’s oil policy as the only means of restoring balance to the market. What limits do economic and social realities place on Saudi oil policy? Would the prospect of a prolonged period of low oil prices precipitate a reversal of the 'new' oil policy? Social peace and a strong and loyal military. The official Saudi and UN population data conflate migrant labour and Saudi citizens in their demographic breakdowns. Since the Saudi government is almost exclusively interested in the welfare, attitudes and employment of only its own citizens, the migrant labour has to be removed from the data to make any meaningful analysis. The proportion of young people in the Saudi only population is much greater than that in the total population (62% compared with 47%). The proportion of youth population (15 to 25 years) rises from 18% in 2010 to nearly 25% in 2020 and does not start to decline until after 2030. By 2020 there will be a 30% increase in the numbers of youth in Saudi Arabia from 3.7 to 4.8 million. The Saudi workforce expands by 25% (>1 million) between 2012 and 2020. The data indicate that Saudi Arabia is facing a prolonged period of demographic challenge due to an expanding youth cohort that will clamour for state employment and subsidies. The provision of employment overwhelmingly rests with the state. Saudi young men also make a significant contingent in jihadi groups active in Syria. These demographic issues are likely to put more strain on the Kingdom’s financial and governing capacity at a time of reduced oil revenues (80% of the government budget). At some point the various conflicting state objectives and realities collide: how to balance the low oil price policy; the need to manage the demographic bulge of young men; the objectives of maintaining a large foreign reserve and not borrowing excessively? Fig.4 shows the forecast development of the Saudi budget through to 2020. The capital component has been reduced by 15% into 2018 and the operating budget has been increased in line with the increase in young men reaching employable age. The break-even oil price for Saudi Arabia is about $80/b. Even with $65 billion of debt (about 5% of GDP), Saudi foreign reserves decline by more than 50% from $764 billion in 2014 to $300 billion by end 2020. 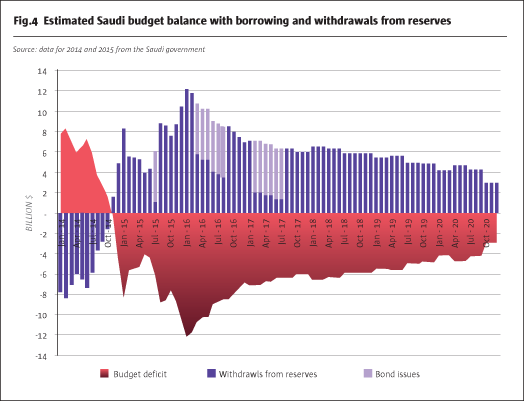 Saudi Arabia will continue to run a budget deficit well into the 2020s. Saudi Arabia’s spending (particularly social welfare, employment, housing and the military) is probably not amenable to much pruning, without jeopardising the social compact between the ruling Al-Saud and the general population. The analysis of demographic issues and the likely future evolution of Saudi state finances suggests that some time before 2020, Saudi Arabia will be under pressure to cut production to try to raise the oil price above the $80/b that it needs to 'balance the books'. This imperative becomes more urgent should there be a developed world recession and/or Libya returns to full production. The elimination of excess oil stocks is a critical factor in the rebalancing of the oil market in the short and medium term. The analysis shows that this can be achieved by normal market processes in a window of opportunity between now and the end of 2017. Until the excess stocks are eliminated there will be continue to be downside vulnerability to the oil price. This weakness will be gradually ameliorated as stock data starts to indicate a significant stock draw is underway. However if this window is partly closed by events, such as a recession in 2016/2017, then it is unlikely that the excess stocks will be eliminated in the next few years. Low oil prices and subdued supply side investment could then persist into the 2020s. This would leave a reversal of Saudi Arabia’s oil policy as the only means of restoring balance to the market in the near term. What limits do economic and social realities place on Saudi oil policy? Would the prospect of a truly prolonged period of low oil prices precipitate a reversal of the 'new' oil policy? Saudi Arabia’s low price policy will erode its foreign reserves and put domestic budgets under pressure. The latter are relatively inelastic as the social compact between the ruling Al-Saud family and the general population is predicated on generous state subsidies and state employment. This pressure will increase into the 2020s due to a bulge of young Saudi males entering the jobs market. At a time when the Middle East is beset by radical jihadi movements, such as the Islamic State based largely on Saudi religious ideology, it is perhaps not wise to be cutting social welfare spending. The demographic and budgetary pressures are likely to lead to a reversal of Saudi oil policy, and a cut in production to try to raise the oil price to a sustainable level, around $80/b. This policy reversal is likely even if the excess stocks are eliminated in 2017 and even more likely if a recession or the early return of Libya to full production puts downward pressure on the oil price. The timing is likely to be well before 2020 but when it is clear that US LTO has fallen significantly so that 'success' could be declared. The USA LTO model forecast, the Saudi demographic data and budget forecasts suggests 2018 as a likely conjunction. This analysis also shows that OPEC and Saudi Arabia remain in control of the oil market. Some commentators and analysts have taken the view that USA LTO has displaced OPEC as the swing producer. The data tell a different story. Saudi Arabia and OPEC’s market power were amply demonstrated in November 2014 and early 2015, when Saudi Arabia’s policy drove the oil price downward. Within three months Saudi Arabia was able to raise production by over 1 million b/d. The analysis of USA LTO shows that it is a price taker with a high cost of new supply, ranging between $40/b and $90/b. US LTO also has a long response time – taking 2 to 3 years to decline by 1 million b/d. 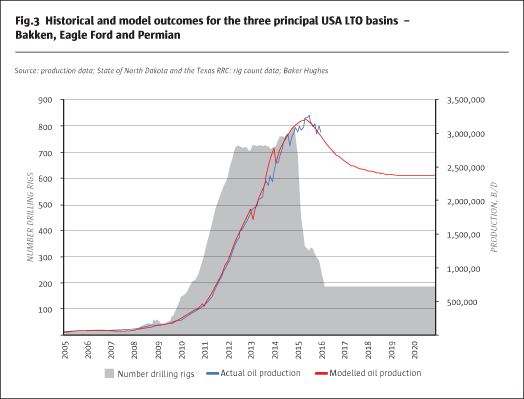 Any significant recovery of USA LTO production is predicated on a rise in oil price at the discretion of OPEC and Saudi Arabia and it will take several years to restore 1 million b/d of US LTO production.